Episode #343 Part II: Superman Family Comic Book Cover Dated May 1962: Superman's Girl Friend Lois Lane #33! Superman's Girl Friend Lois Lane 33, May 1962! Download Episode 343 Part II! With our coverage of MegaCon 2016 over, we step back to finish our look at the Superman Family comic books cover dated May 1962, this time featuring SUPERMAN'S GIRL FRIEND LOIS LANE 33. It contained 32 pages for the cover price of 12¢. The editor was Mort Weisinger, and the cover was pencilled by Curt Swan and inked by George Klein. It featured the issue's first story. 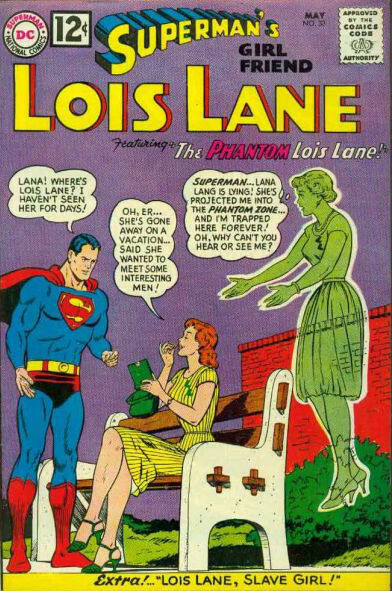 - THE PHANTOM LOIS LANE (9 pgs. ), writer unknown according to Mike's Amazing World Of DC Comics. The Grand Comic Book Database lists Jerry Siegel? as the possible writer. Since there is some disagreement with the writer credit, we won't credit it towards Siegel's silver age production. The story was pencilled by Curt Swan and inked by George Klein, and was reprinted in SUPERMAN: TALES FROM THE PHANTOM ZONE. - THE CANDID CAMERA KID (8 pgs. ), writer unknown according to Mike's Amazing World Of DC Comics, while the Grand Comic Book Database lists Jerry Coleman (?) as the possible writer. The artist was Kurt Schaffenberger. - LOIS LANE, SLAVE GIRL (9 pgs. ), writer unknown according to Mike's Amazing World Of DC Comics. The Grand Comic Book Database and Comic Book Database.com credit Robert Bernstein as the writer. The artist was Kurt Schaffenberger. This story was also reprinted in SUPERMAN'S GIRL FRIEND LOIS LANE 95, September/October 1969, published on July 8, 1969. It was a 64 Pg. Giant for the cover price of 25¢. This episode begins with the monthly MY PULL LIST segment, where I review the June 2016 comic books, published in April, from the Discount Comic Book Service. Elsewhere in DC Comics, 29 titles carried the May or May/June 1962 cover date, according to Mike's Amazing World Of Comics. They were covered at the end of Episode 276, for the week of Wednesday, August 7, 2013. Next: SUPERMAN FAMILY COMIC BOOKS COVER DATED JUNE 1962: PART I: SUPERMAN'S PAL JIMMY OLSEN 61 & PART II: WORLD'S FINEST COMICS 126! - The SUPERMAN PODCAST NETWORK! Episode #344 Part IX: MegaCon 2016 Wrap Up! Download Episode 344 Part IX! - (9:29) ANGEL FALLING, written by Jeffrey Kaufman, pencilled by Kevin West, inked by Mark McKenna, Bob Wiacek, Jack Purcell and Kevin Yates, colored by Tom Chu and Pete Pantazis and lettered by John Hunt, produced by Big City Comics. - (14:29) EVIE DUNN'S FETCH: AN ODYSSEY Part 1: OLYMPUS OR BUST, written by Evie Dunn, scripted by Martin Dunn, Aly Dunn and Brie Tart, pencilled by Dee Fish, inked by Martin Dunn, colored by Gab Contreas and Dustin Orazi, published by CAE Studios. During the recording I mention that MegaCon's facebook page gives the 2017 convention was scheduled for May 25 - May 28, 2016, but it wasn't from MegaCon's official facebook page. MegaCon's website hasn't posted official dates yet, so check the website in the future for more details. Next Episode: SUPERMAN FAMILY COMIC BOOK COVER DATED MAY 1962 PART II: SUPERMAN'S GIRL FRIEND LOIS LANE 33! Followed by: SUPERMAN FAMILY COMIC BOOKS COVER DATED JUNE 1962: PART I: SUPERMAN'S PAL JIMMY OLSEN 61 & PART II: WORLD'S FINEST COMICS 126! Episode #344 Part VIII: MegaCon 2016: Indie Revolution: Self-Publishing Your Dreams Panel! (L to R:) Thomas Mumme, Mike Horan, Ruben Romero and Martin Dunn! Download Episode 344 Part VIII! Next Episode: MEGACON 2016 PART IX: WRAP UP! Followed by: SUPERMAN FAMILY COMIC BOOK COVER DATED MAY 1962: SUPERMAN'S GIRL FRIEND LOIS LANE 33! And: SUPERMAN FAMILY COMIC BOOK COVER DATED JUNE 1962: PART I: SUPERMAN'S PAL JIMMY OLSEN 61 & PART II: WORLD'S FINEST COMICS 126! Episode #344 Part VII: MegaCon 2016: Sunday Recap! (L to R, Top to Bottom:) Batsurfer, .Burt Ward, Adam West, Gail Simone and Arthur Adams! This episode covers the final day of MegaCon on Sunday, May 29, 2016, when I attended the Celebrity Q & A with Adam West and Burt Ward, and Creator Spotlights with Gail Simone and Arthur Adams. Next Episode: MEGACON 2016 PART VIII: INDIE REVOLUTION: SELF PUBLISHING YOUR DREAMS PANEL! Followed by: MEGACON 2016 PART IX: WRAP UP! Then we return to our regularly scheduled journey through the Time Barrier to finish looking at: SUPERMAN FAMILY COMIC BOOK COVER DATED MAY 1962 PART II: SUPERMAN'S GIRL FRIEND LOIS LANE 33! And: SUPERMAN FAMILY COMIC BOOKS COVER DATED JUNE 1962: PART I: SUPERMAN'S PAL JIMMY OLSEN 61 & PART II: WORLD'S FINEST COMICS 126! Episode #344 Part VI: MegaCon 2016: Saturday Recap! (L to R:) Replica B-9 Robot from the LOST IN SPACE TV series, Adam Hughes, David Lynch! Download Episode 344 Part VI! This MegaCon episode summarizes my day at the convention on Saturday, May 28, 2016. I attended the creator spotlight panels on comic book artists Adam Hughes and David Finch. 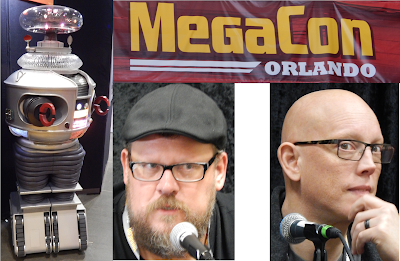 Next Episodes: MEGACON 2016 PART VII: SUNDAY RECAP! 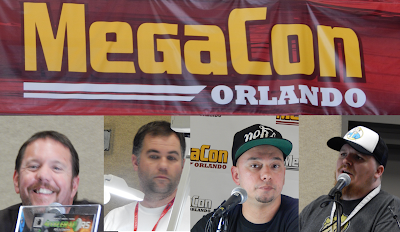 - MEGACON 2016 PART VIII: WRAP-UP EPISODE! Then we will return to our regularly scheduled trip to the Silver Age with: SUPERMAN FAMILY COMIC BOOK COVER DATED MAY 1962 PART II: SUPERMAN'S GIRL FRIEND LOIS LANE 33! Episode #344 Part V: Mega Con 2016: So You Wanna Make Comics? Breaking In Panel! (L to R:) Ruben Romero, Amy Chu, Ramon Perez, Brian Pulido and panel moderator Martin Dunn! Download Episode 344 Part V! Ruben Romero of Think Alike Productions, Amy Chu, Ramon Perez and Brian Pulido of Mischief Makers Studios and Lady Death Universe. Next Episode: MEGACON 2016 PART VI: SATURDAY RECAP! Followed by: MEGACON 2016 PART VII: SUNDAY RECAP! And: MEGACON 2016 PART VIII: INDIE REVOLUTION: SELF PUBLISHING YOUR DREAMS PANEL! Episode #344 Part IV: MegaCon 2016: The Death To Fanboys IV: A New Hope Panel! (L to R:) Martin Dunn panel moderator, Aly Dunn, Jo Witherington and Dustin Holiver! Download Episode 344 Part IV! NOTE: The following episode contains a little bit of EXPLICIT language. This was the sixth panel I attended at MegaCon on Friday, May 27, 2016. The reason this panel was called DEATH TO FANBOYS PART IV was because this was the fourth year that Martin Dunn has hosted it at MegaCon, Each year it touches on a different topic, and this year the theme was Literacy And Comic Books. Next Episode: MEGACON 2016 PART V: SO YOU WANNA MAKE COMICS? BREAKING IN PANEL! Followed by: MEGACON 2016 PART VI: SATURDAY RECAP! Episode #344 Part III: MegaCon 2016: Friday Recap! (L to R, Top to Bottom:) MegaCon banner, Nathan Sturgeon and Hannah Hogan (dressed as Rick from the Rick & Morty cartoon), Nathan and Hannah wearing shirts they bought at MegaCon, John Dixon, Liz Hoffmann, Rissa Bowes, Hannah and Nathan, Gail Simone, Joe Caramanga and Peter David, Greg Capullo and Kevin Conroy! Download Episode 344 Part III! Next Episode: DEATH TO FANBOYS IV: A NEW HOPE PANEL! Followed By: SO YOU WANNA MAKE COMICS? BREAKING IN PANEL! Then: MEGACON 2016 PART VI: SATURDAY RECAP!